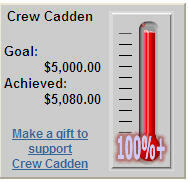 I was reminded of the power of a graphic to prove a point and motivate people to action when my team in the Breast Cancer fundraising walk this past weekend was trying to hit our goal of $5,000. In the final week leading up to the walk, I found myself going online just about every day to see the stream of red ink creeping up the thermometer toward our goal. It was incredibly motivational for me, but I suspected that I was the lone person to feel this way until my mom mentioned that she had been doing the same thing. When our team hit our goal the day before the walk, I showed my mom the little graphic, now animated and celebratory, on my iPhone. Her over-the-head arm pump and huge smile were more enthusiastic than the little sparkling graphic, but not by much. This entry was posted on Thursday, October 4th, 2007 at 1:05 pm	and is filed under Usability, Web design. You can follow any responses to this entry through the RSS 2.0 feed. Both comments and pings are currently closed.